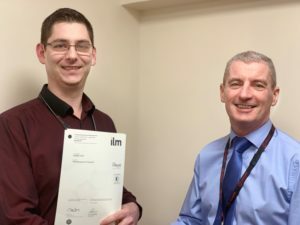 We are happy to announce that two members of the Pointer team, Johnny Forde and Dan Howe, have both received their ILM level 3 award. While completing this qualification, Johnny and Dan had to take part in various modules such as, conflict management, problem solving and improving performance within a team. This qualification has provided them with a new insight into the qualities it takes to effectively manage and participate within a team in order to maximise performance and create a productive environment. In order to complete the course they also had to complete a presentation on a topic related directly to Pointer which has also provided an opportunity for management to take on board any points raised and perhaps implement them in the future. These qualifications have previously proven to give team members a better insight into the business and refresh their perspective to allow them to highlight key areas of improvement for the business. Johnny Forde, in particular, scored very highly and as a result was awarded a £25 gift card to the Silverburn Shopping Centre in Glasgow to show our recognition of his new qualification. We are delighted to see our team members focusing on developing their skills and continuous improvement.